Some custom bike builds are completed in days. Others take weeks or months. 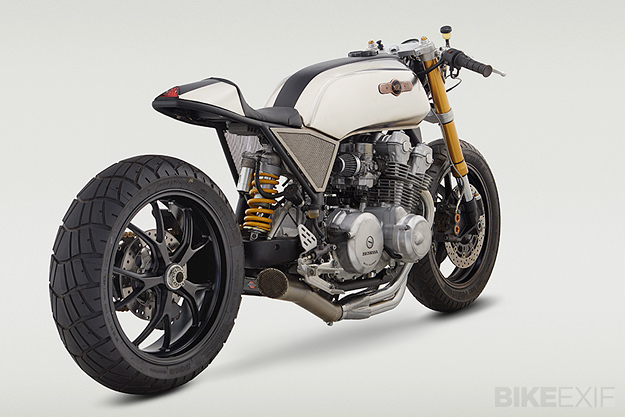 But this new build from Classified Moto, a postmodern take on the classic Honda CB cafe racer, took well over two years. You might have seen sneak previews on the Classified Moto Facebook page, but this is an exclusive look at the studio images. They’ve been worth the wait. After hours, Ricky joined Ryland and mechanic Greg Ownby in marathon garage sessions to tear down the donor bike, a 1980 Honda CB750F Super Sport. ‘SuperStrada’ slowly took shape. The whole front end is from a Yamaha YZF-R6 sportbike, including the forks, front wheel and hand controls. The forks are locked into place with Classified Moto’s signature triple tree conversion, using a custom billet upper clamp. 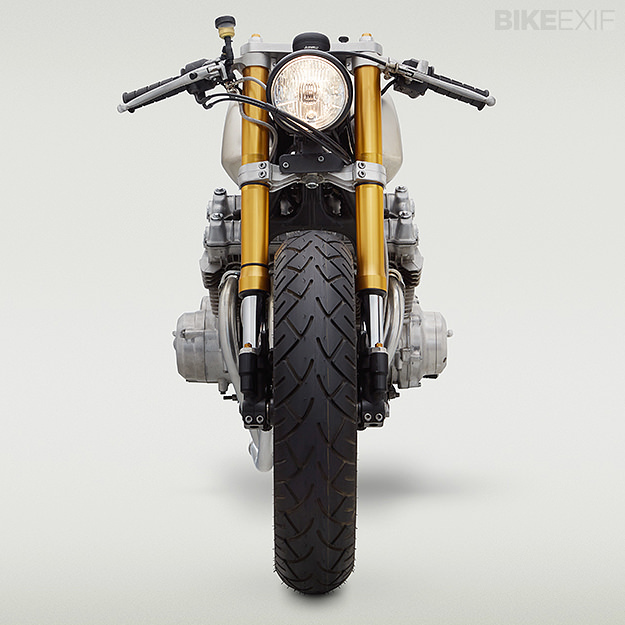 The single-sided swing arm is from a Ducati Multistrada, complete with factory Showa shock, and the rear wheel is from a Ducati 1098. Rubber is Metzeler ME880 at the front, Dunlop D616 at the back. Other mods include a customized Vance & Hines 4-into-1 exhaust system, a lightweight li-ion battery and a digital gauge. Classified also installed a custom front sprocket, a Superlite 525 rear sprocket and a gold D.I.D X-Ring chain. 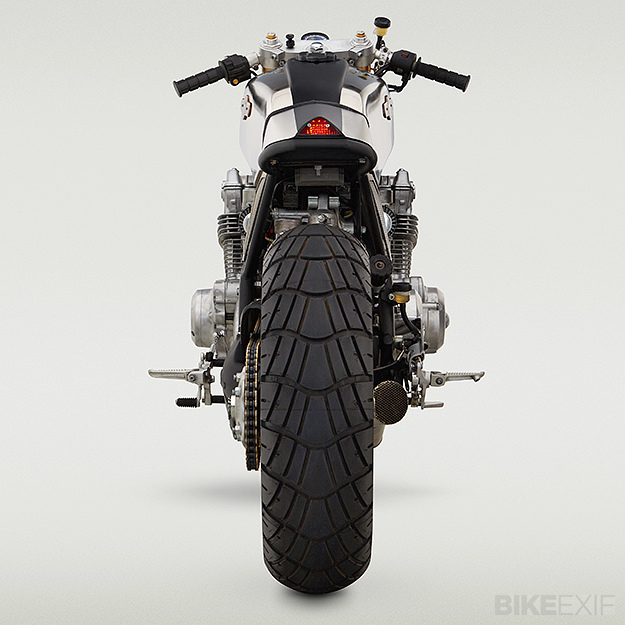 The frame modifications were handled by Alex Heath, along with the custom tail section and nickel-plated side panels. The tank, surprisingly, is basically stock Honda CB. “It ended up looking just right,” says Ryland. “The side panels finish the irregular lines off and everything just flows into the new tail section.” The seat was built and shaped in-house, and then upholstered by Richmond, VA neighbor Roy Baird. One thing is for sure: Ryland has nailed the stance of SuperStrada—low and sleek, with a drag muscle vibe. 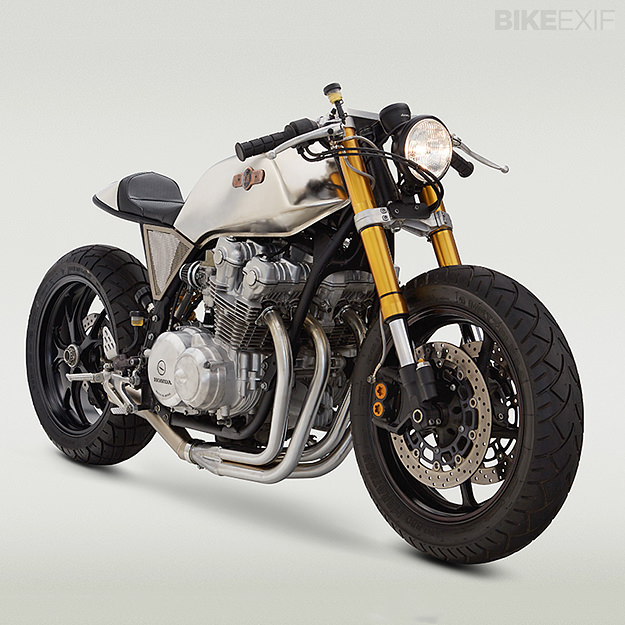 Would you find a place for this Honda CB cafe racer in your garage? Images by Adam Ewing. 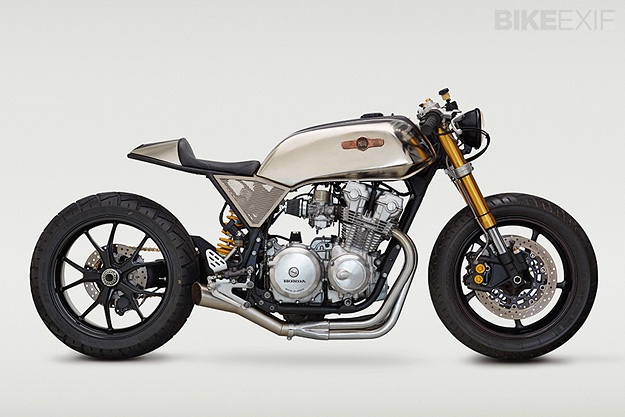 Visit the Classified Moto website to see more of Ryland’s builds.